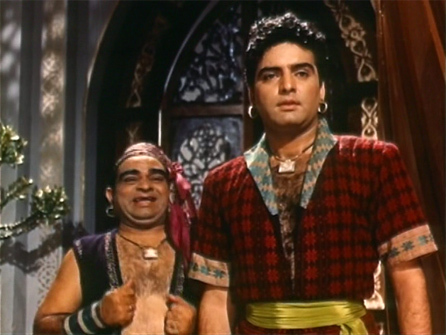 When a film’s credits list Homi Wadia as director and producer; JBH Wadia as screenplay writer; John Cawas (Nadia’s frequent co-star) as assistant director; Babubhai Mistry as art director; and a cast which includes Feroz Khan, Kumari Naaz, and Dog Romer—I am guaranteed to love it. When Todd reviewed it over at D4k I felt actual despair at not having it myself. Luckily I have since fixed that, and this weekend was able to wallow in the sumptuous, colorful, cracktastic goodness that is Char Dervesh. Feroz looks like he is about 18 years old, and he is faced with seemingly insurmountable obstacles: a two-headed monster, a lecherous sorcerer, greedy brothers and a lazy genie (with full support from the Genie’s Union), among others. He is aided by the love of two beautiful princesses, a diminutive sidekick and his clever canine in a rollicking, humorous Arabian Nights tale with really lovely songs by GS Kohli throughout.